Want the best meat in town? 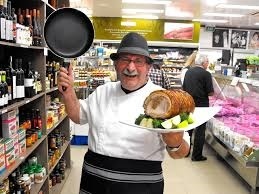 Mondo is an Inglewood icon, having been there since 1979, and is probably the best butcher in the whole of Perth. They also stock a large range of condiments to go with the meat, and most items are displayed with a flair, making them look so inviting. Their range is extremely varied, their meat is unbelievably good, and it is free of hormones and chemicals, plus they have a variety of free range products. Their goods are sourced from local suppliers where possible and include Dandaragan Certified Organic Beef. They sell some things you cannot buy elsewhere, and if you want something unusual in the way of meat and poultry, Mondo's is definitely the place to go. They make their own cranberry sauce around Christmas and this is so different to the bought one, as well as their Christmas poultry range which is unique and they will even supply it cooked if you want a totally stress free Christmas day. Some of the unusual items they stock are pigeons, silkie chickens, fresh ducks, venison, quail, spatchcocks and more. Apart from meat, they carry an exclusive range of delicatessen goods including gluten free (marked with a yellow dot). Another product they carry is a good variety of cheeses and many of these are vacuum packed for freshness and longevity. Their home cooked meals, while rather expensive, are excellent, and you could easily "fool" anyone into thinking you had made these yourself! They sell the above meat and this is one of the best steaks available, and absolutely delicious if cooked correctly. They also have the most delicious White Rocks baby veal, which is so much nicer than alternatives and makes a delicious schnitzel. Their range of small-goods/processed meats is far superior to most other butchers as it is made with the best ingredients. Mondo are one of the few people who make bacon without the nasty chemicals that make the meat so unhealthy. Mondo's make a bacon that is nitrate free and therefore a different colour to the normal bacon you can buy. Some of their more unusual cuts of meat are packed in Cryovac as, mentioned above, it will last far longer when this method is used, and does not need to be frozen. I am normally a vegetarian, however roughly once a month I like to eat meat, and on this visit I bought the best-minced beef and made this recipe. On this occasion, I had a very friendly assistant who explained to me that it was his first day on the job! The owner, Vince Garreffa, and his wife, Anne, host and conduct a tour every year and although this one has already taken place, it will give you a good idea of these fabulous tours! The accent is on places and of course, the meals. Vince is a character, and I am sure his tours would be loads of fun and laughter! Vince also shares his knowledge and love of cooking and holds regular cooking classes. Reading this will give you an insight into these and indeed, into Vince's attitude to life. They also do catering and you can see the details here. This can include gluten free, Vegetarian Meals, Salads, Pasta, Hot Vegetables, Platters, Bread, Sweets, and Finger Food, and you can see more prices and food here. Why not go around lunch time and try out their freshly made to orde, sandwiches or rolls - they are delicious, and well worth the trip here if only for this. Mondo is an establishment that I can spend a long time looking around, even though I no longer eat much meat, and it is well worth a visit to see the unique and unusual items sold at this "Best in Perth" butcher! Be sure to drop into 824 Beaufort Street, Inglewood, and check out their website, or you can even order online.